“In the end the national movement will win the respect of the Administration in Constantinople. Let me assure you that it is quite a mistake to believe that the present Government are inspired with good intentions. 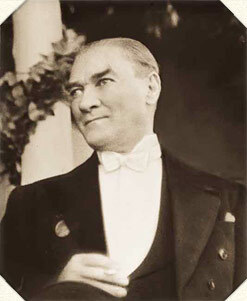 “Before I left Erzerum, I wrote to Fetid Pasha and explained the true state of affairs to him, giving him definitely to understand that no power on earth can stand up against the national will and the national strength, and at the same time warning him against further persistence in his opposition. “But this misguided man, instead of answering me, announced that the national movement was being conducted by merely a few in dividuals. “Instead of listening to my patriotic and unselfish warnings, he preferred to depend on misleading reports from certain Valis who, blinded by their anxiety about their own private interests and led away by their ignorance, imagined that they would be able to save the situation by proceeding guardedly with both parties at the same time. “Now that the Government has sunk to the lowest depths of scoundrelism, treachery and impotence, and the nation has plainly recognised the true condition of affairs, it is clearly our duty to see that a new Cabinet, representing the will of the nation, shall come into power as soon as possible. “In case the members of the present Cabinet should be anxious about their own persons or their lives, we hold the opinion that it is in the highest interests of the nation that it should stand far above such paltry considerations, and is prepared to give them all the assu rances and guarantees they desire. “But if they remain obdurate and continue their course along the evil road they have chosen, the reponsibility for the consequences that might result therefrom will fall entirely on their own shoulders. The words I have just quoted embody the gist of a very long message. Then Kerim Pasha opened a second stage of our exchange of tele grams with the following introduction : “First, I beg you to be kind enough to present my greetings and respects to all the honourable persons who are with Your Excellency.” Then Kerim Pasha continued: cc Your Excellency has covered the questions I referred to. Twice you excused yourself for having to point out errors in the suggestions I made. You will understand how very difficult it is for me to act as intermediary without knowing all the particulars and local conditions. But we are really anxious to protect the interests of the country and this anxiety is the only guiding star that illuminates our path. “At this hour, when the fate of our country is wavering in the balance, I would like to express my earnest hope that, thanks to the close co-operation between the Government and the nation, we may arrive at a happy issue. “Let us come to it and keep to it,” I said. “Your Excellency,” I interrupted, “we can no longer suffer our legitimate acts or the manifestation of the national will to be misinter preted or exposed to criticism and correction. In particular, we cannot admit that the counter-proposals of a Cabinet convicted of treason should serve as a ground for reproaches. Representing ^ the formal desire of the nation, we made our position quite clear. Is it necessary to revert to it? “If, instead of aswering this national demand which categorically insists shall be realised, you attempt to intervene in favour of Fend Pashas s Cabinet, so that he may continue to defile the supreme dignity of the Empire, your efforts will not lead to any satisfactory results. Besides, I am afraid that the friendly regard we entertain for you may be shaken by such an attempt. “If Ferid Pasha immediately hands over his position to an irre proachable person and if you are convinced that he will do so, there is no question left to be settled. If he is not prepared to do this, your mediation can have no other result than to do you harm and lead to unnecessary trouble. “The task we have assumed in the interest of the country will be looked upon as pure by the Almighty, and will also appear to be the same in the eyes of the nation. The Good God who guides our destiry will undoubtedly show the leaders the best way to save the nation and the country. I send you my brotherly greetings.” It was 4.30 in the morning when my turn came to reply. I could not leave the questions raised by Kerim Pasha unanswered. After having explained my views to him, I concluded my message by saying: “What must be the aim of patriots like ourselves? Is it to seek the impossible by endeavouring to reconcile the nation to Ferid Pasha, from whom the nation can expect nothing in the future but mischief? Or, is it to attempt to convince the Padishah of the necessity of confiding the reins of Government, without loss of time, to a Cabinet to succeed that now in power, which will appreciate the needs and destiny of our country and nation? Instead of replying clearly, Kerim Pasha answered again with long circumlocutions. It was I who introduced the third phase of our telegraphic con versation, although it was then 6.10 a. m.